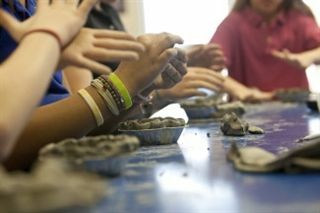 Our visual arts curriculum integrates experimentation with a variety of media, including drawing, painting, printmaking, clay, weaving, and sculpture. With art several times a week, students can recreate the whimsical dessert paintings of Wayne Thiebaud or mold Navajo storytellers to complement a social studies unit. Students have an outlet to visually express themselves. They learn a sense of responsibility, independence, and self-reliance to do their very best. Their art work is displayed throughout the school and at various community-sponsored art events including the Academy Art Museum, Hospice House, and the Empty Bowls project.